Twitter Chats can be a useful tool to social media marketers. Most Twitter chats follow the same format. The host asks questions, the guest and community respond, and conversation ensues. However, put forth in that manner, chaos will also ensue. That’s why Twitter chat hosts follow a numbered format for questions and answers. Twitter chats can be fast and busy. If they’re not organized, no one will be able to follow the chat, and you won’t gain a very strong community of participants. Welcome community members to your chat and invite them all to share a little about themselves. Allow about three to five minutes for this. For most Twitter chats, each question will be prefaced with a Q1 for Question 1. Those who answer the question will respond A1 for Answer 1. This way, there’s no mistake about which questions are being answered because some people come late but start at the beginning. 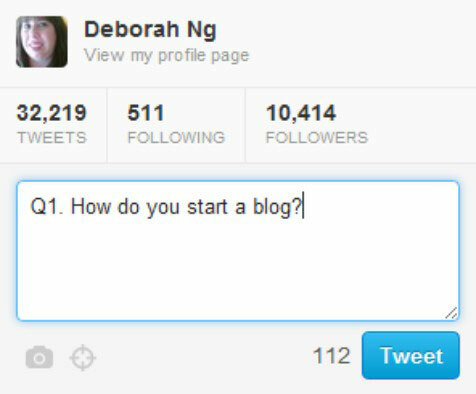 When questioning your guest, always @reply their name — for example, “@debng, Q1. What is your favorite ice cream flavor?” If you have no guests, don’t worry about the @reply unless you reach out to a specific person. Retweet your questions as well as the guest’s answers. See what responses your community is sharing and retweet the best of those, too. After about 10 or 15 minutes, ask the next question. Most hosts share four to six questions. Just time them accordingly so that you have enough space for responding. (Optional) Save the last ten minutes for the community to ask questions to the guests. Three minutes before the hour is up, thank your guest and ask him whether he has anything to plug or promote. End the chat with any announcement you need to make, including the next week’s guests. Don’t be afraid to ask questions of your community as you see opportunity during the discussion. If you’d like for people to expand upon their answers or to keep the chat flowing between numbered questions, it’s fine to throw out some non-numbered questions for your participants.